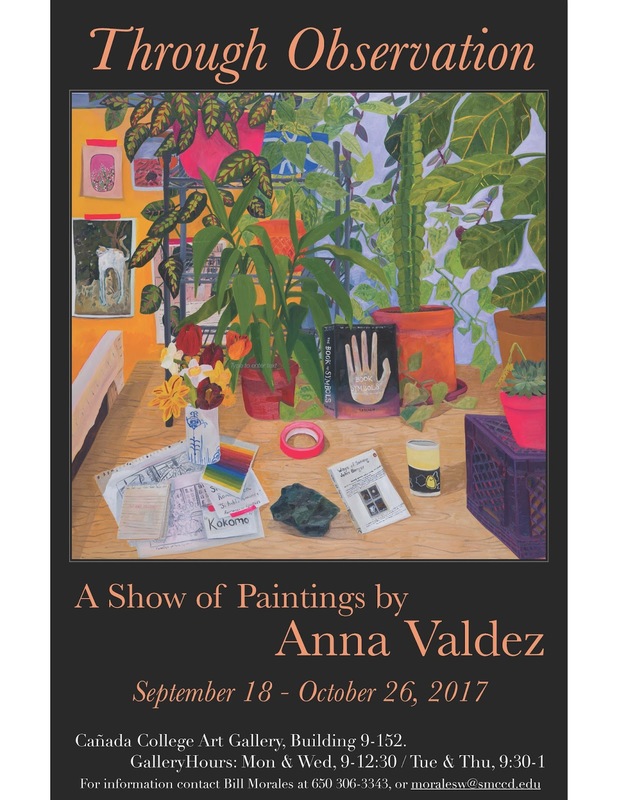 The Cañada College Art Department presents “Through Observation”, an exhibition of paintings by the Bay Area artist Anna Valdez. 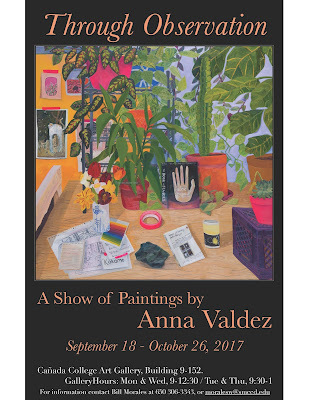 The exhibition runs from September 18 – October 26 in the Cañada College Art Gallery, Building 9, Room 152. Valdez is showing nine still lifes, all completed in the last two years. Painted in a manner that at times may appear simple, these works are beautiful orchestrations of objects and spaces in her studio, featuring her collection of plants, books, fabric, and works of art. The large scale of some of the paintings, up to six feet across, can bring the viewer into that world of the studio. The familiarity of the objects combines with vibrant color, a freshness of paint application, and a feel for abstraction create a wonderful dual reality. The Cañada College Art Gallery is open Mon & Wed, 9 a.m. - 12:30 p.m. and on Tuesdays and Thursdays, 9 a.m. - 1 p.m.. For more information, contact Bill Morales; 306-3343, moralesw@smccd.edu.